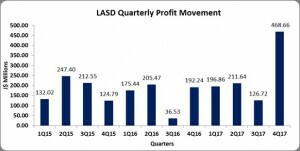 Lasco Distributors Limited (LASD) For the year ended March 31, 2018 posted a 3% growth in revenues to $16.27 billion, up from $15.80 billion in the corresponding period in 2017. Cost of sales amounted to $13.10 billion relative to the $12.87 billion posted for the prior year. Gross profits also recorded an increased, up by 8%, closing at $3.17 billion compared to the $2.94 billion reported last year. This represented an increase of $234.47 million. Other operating income jumped 242%, to end the year at $395.41 million compared to the $115.20 million in the previous year. Operating Expenses grew by 5% to ending the period at $2.49 billion (2017: $2.36 billion). Of this, Administrative and Other expenses rose 8% to $1.92 billion (2017: $1.78 billion), while Selling and Promotion expenses slipped 4% to $568.17 million (2017: $583.98 million). Operating Profit improved 57% to close at $1.08 billion relative to $689.51 million for the comparable period of 2017. Finance costs decreased 80%, totaling $524,000 for the year compared to $2.62 million in the year prior. Pre-tax profits, totaled $1.08 billion, an increase of 57% from the $686.89 million for the prior year. Net Profit for the year saw a 65% increase closing at $1 billion (2017: $609.68 million), after tax charges of $75.49 million (2017: $77.21 million). Earnings per share for the year ended March 2018 totaled $0.29 (2017: $0.17). The number of shares utilized in our calculations amounted to 3,424,462,483 units. EPS for the fourth quarter was $0.134 (2017: $0. 056). As of May 30, 2018 LASD stock traded at $4.09. Total comprehensive income for the year was $1.01 billion (2017: $640.34 million). Total assets amounted to $8.51 billion compared to $7.39 billion in the prior year, an increase of 15%. Notably, Property, Plant and Equipment closed at $1.48billion, an increase of 9.82% over the previous year. Receivables also contributed to the increase in assets with an 18% growth to $2.49 billion (2017: $2.12 billion). Shareholders equity amounted to $4.57 billion as at March 31, 2018 (2017: $4.05 billion). This resulted in book value per share of $1.31 (2017: $1.16).